Newman Sound Men’s Choir is thrilled to present their first ever solo Christmas concert! Join us for an afternoon filled with Christmas cheer, including some of your favourite classic and contemporary carols – Silent Night, Jingle Bells, O Come All Ye Faithful, and more. Families are most welcome as our soloists will feature the children of our choristers. Let Newman Sound bring the sounds of the season while you sit back, relax, and get into the Christmas spirit! Click here to purchase tickets! Newman Sound Men's Choir and Alta Voce Chamber Choir present Remember, a special concert commemorating all who have served Newfoundland & Labrador and Canada in battles past and present. The concert will feature some of the most poignant music written for the occasion. You will also be treated to performances by many of our incredible soloists as well as Beyond Youth Choir from Gander, NL. This concert gives us the opportunity to pay homage to those who have served and to reflect upon the sacrifices others continue to make so that we may experience and appreciate peace in our lives. We invite you to make this special event a part of your Remembrance observances. Newman Sound Men's Choir is deeply grateful to the Elinor Gill Ratcliffe Foundation for its sponsorship of our annual Remembrance Day Concert. Advance purchases are recommended. Tickets also available at the door. All veterans are invited to attend the concert for free with special reserved seating. Life has a rhythm - a heart beat. From the pulse of big cities to the cadence of village life, cultures around the world celebrate life's journey through music and movement. With the help of esteemed NL percussionist, Rob Power, and a unique interpretation of Eric Whitacre's famous Sleep arranged for marimbas, are just a taste of the rich musical tapestry we have in store! 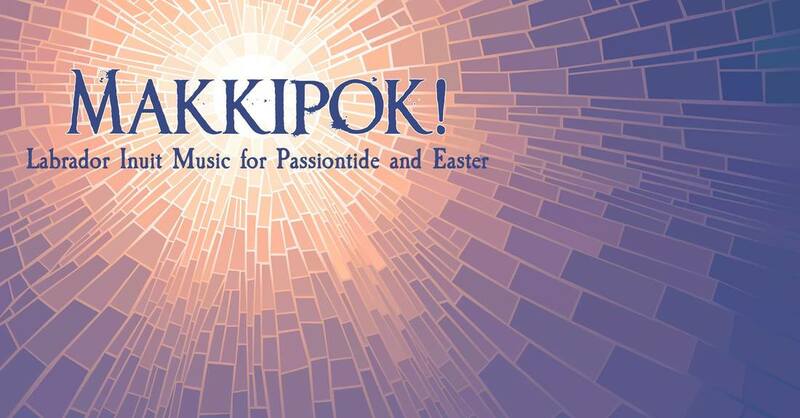 Lady Cove Women's Choir and Newfoundland Symphony Orchestra present: Sinfonia 3: Makkipok! More than 200 years ago, Moravian missionaries introduced European sacred music to the Inuit people of Labrador. Across the centuries, Inuit singers and instrumentalists transformed an imported music into a unique expression of Inuit cultural identity. Makkipok! features some of these beautiful 18th and 19th century classical works for choir and orchestra, reconstructed from original manuscripts found in the churches in Nain, Hopedale and Makkovik. On February 10, Newman Sound Men's Choir will proudly perform in our 11th annual event called Love Songs for Seniors. Throughout the day, Newman Sound will perform at three different seniors' homes in the spirit of Valentine's Day. This community outreach program is warmly appreciated every year by residents, their families and staff as our generous singers gladly donate a full day of sharing our music with these beautiful audiences. Newman Sound will gratefully accept pledges of any amount to support this valued outreach program and our other artistic endeavours throughout the year. Newman Sound is a registered charity and will issue donation tax receipts for amounts of $20 and higher. If you would like to offer your support for our endeavours, simply send an email to contact@newmansound.ca, or contact any of our singers you may personally know. Feliz Navidad - A World Christmas! Joyeux Noël | Frohe Weihnachten | Mele Kalikamaka | Buon Natale | Gledig Jul! Christmas is a tradition celebrated around the world - with customs and festivities as unique as the countries from which they come. 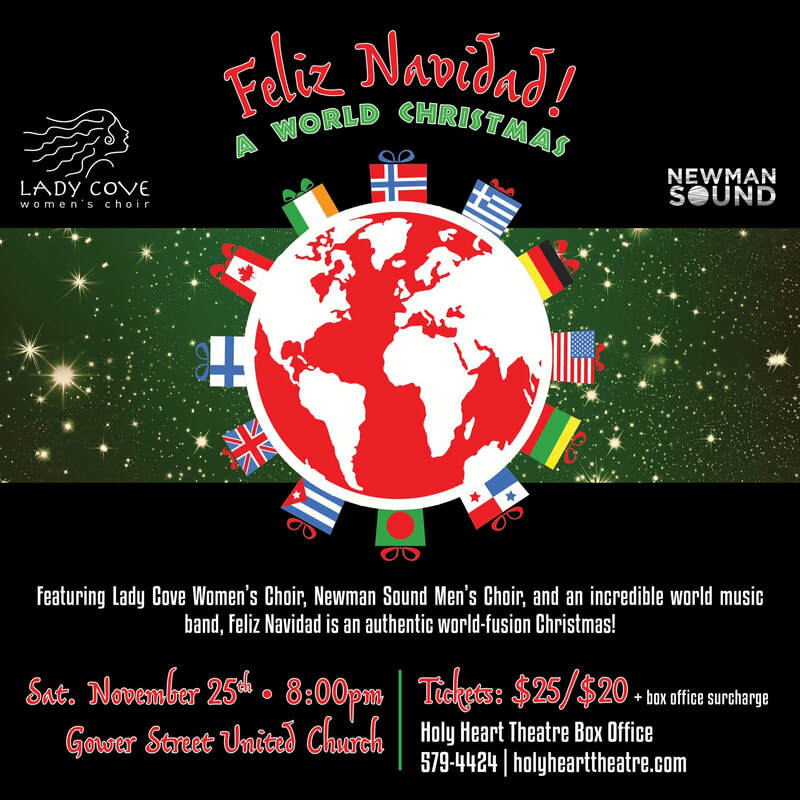 Featuring Lady Cove Women's Choir, Newman Sound Men's Choir, and arrangements made famous by the Juno award-winning Vancouver Chamber Choir, Feliz Navidad is an authentic world-fusion Christmas. Joined by an incredible world music band, this promises to be a feast for the ears! 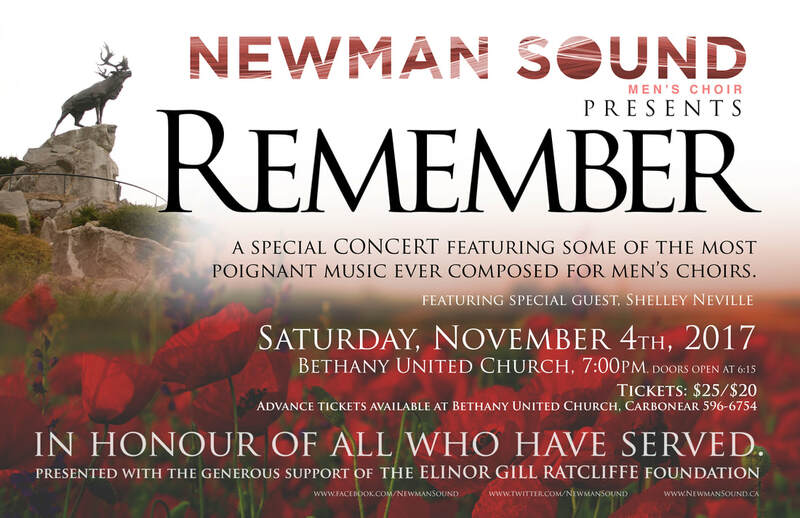 On Saturday, November 4th, Newman Sound Men's Choir will present Remember, a special concert commemorating all who have served Newfoundland and Canada in battles past and present. The concert will feature some of the most poignant music written for the occasion, featuring popular songs of World War I and II. You will also be treated to performances by many of our incredible soloists as well as our very special guest, Shelley Neville. Doors open at 6:15pm. Concert 7pm. Summer love is in the air! 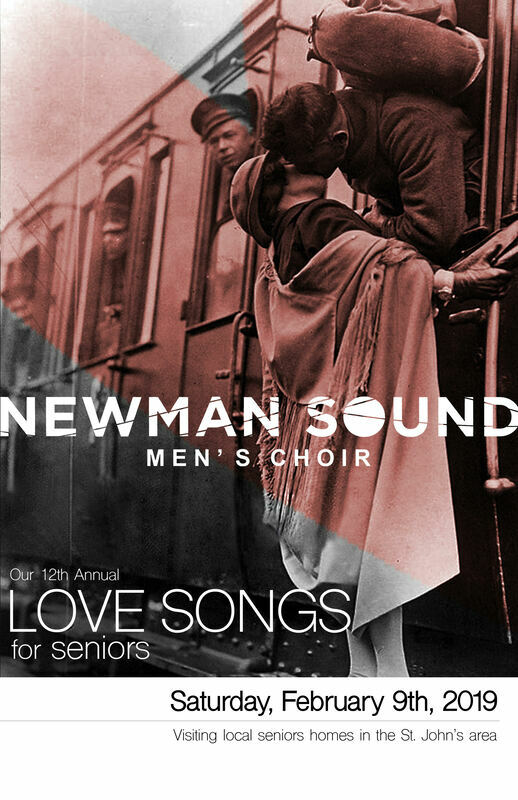 Newman Sound Men's Choir will be closing out the season with timeless songs of love and life - from an intimate setting of Lord Byron's famous poem "She Walks in Beauty", to the contemporary hit song "Fix You" by British band, Coldplay. Joined by acclaimed dancer and choreographer, Lynn Panting, the evening promises to be a feast for the ears and eyes, the heart and soul! We're also pleased to be joined by the young men of the Holy Heart of Mary High School Low Notes, under the direction of Robert Colbourne. 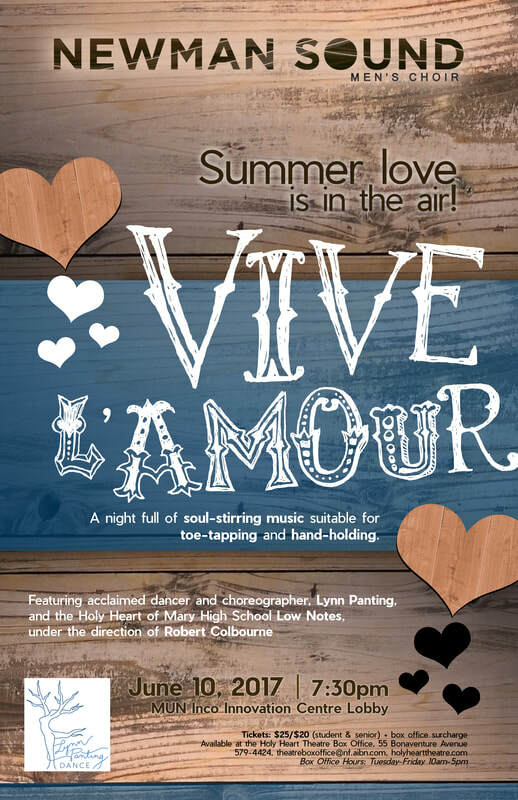 So grab a set of tickets for you and your sweetheart - and enjoy a night full of soul-stirring music suitable for toe-tapping and hand=holding. 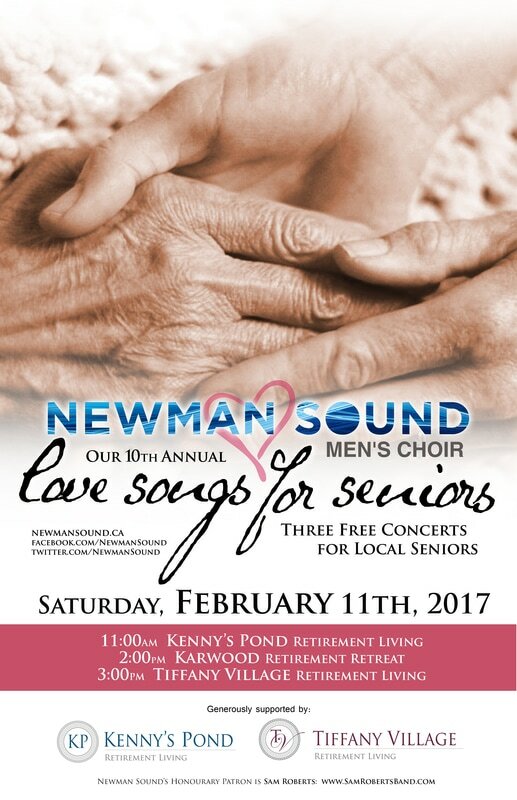 On February 11, Newman Sound Men's Choir will proudly perform in our 10th annual event called Love Songs for Seniors. Throughout the day, Newman Sound will perform at three different seniors' homes in the spirit of Valentine's Day. This community outreach program is warmly appreciated every year by residents, their families and staff as our generous singers gladly donate a full day of sharing our music with these beautiful audiences. Performances are scheduled as follows. If you are related to or know residents of these homes, we invite you to come along and share the love! 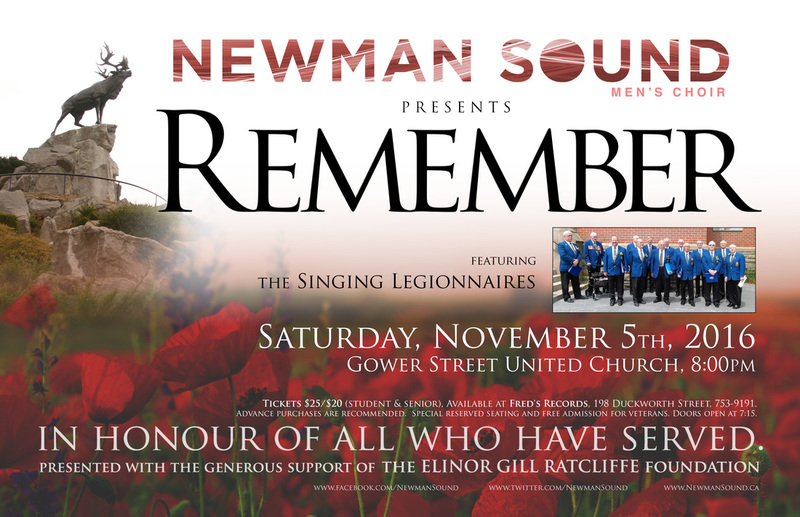 On Saturday, November 5th, Newman Sound Men's Choir will represent Remember, a special concert commemorating all who have served Newfoundland and Canada in battles, past and present. The concert will feature some of the most poignant music written for this occasion. You will also be treated to performances by many of our incredible soloists as well as our special guest, The Singing Legionnaires. 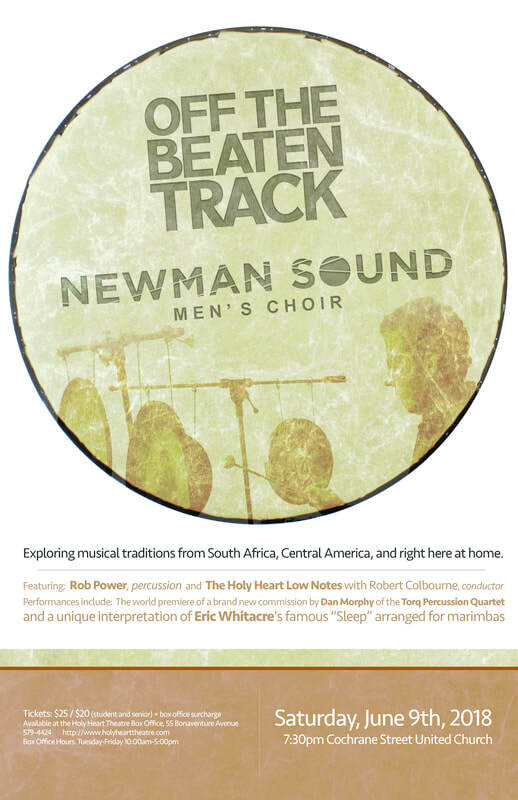 Newman Sound Men's Choir next performance will be on Friday, June 17 at the Suncor Energy Hall, located at the Memorial University School of Music. Who needs the luck of the Irish when you can celebrate St. Paddy's Day with Newman Sound Men's Choir! In a relaxed setting, you'll be treated to performances of some of your favourite Irish and Irish-Newfoundland tunes, including The Wild Rover, Danny Boy and Black Velvet Band, just to name a few. So why not join us for a pint, a sing-a-long and maybe even a scuff - and when we serve the scoff (poutine), you just might feel like you found a four-leaf clover or the pot of gold at the end of the rainbow! Sláinte! Newman Sound Men's Choir and The Conception Bay South Concert Band presents REMEMBER, a special concert commemorating all who have served Newfoundland and Canada in battles past and present. The concert will feature some of the most poignant music written for the occasion. *All veterans are invited to attend the concert for free with special reserved seating. 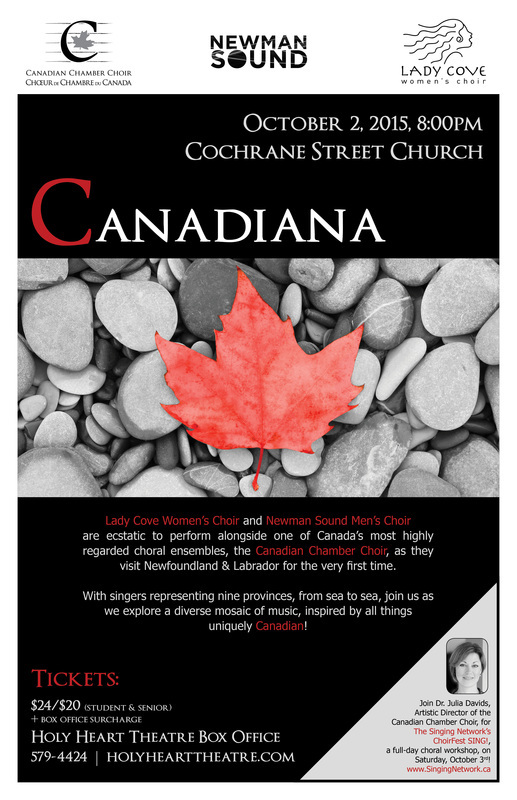 Featuring: Canadian Chamber Choir, Lady Cove Women's Choir and Newman Sound Men's Choir. 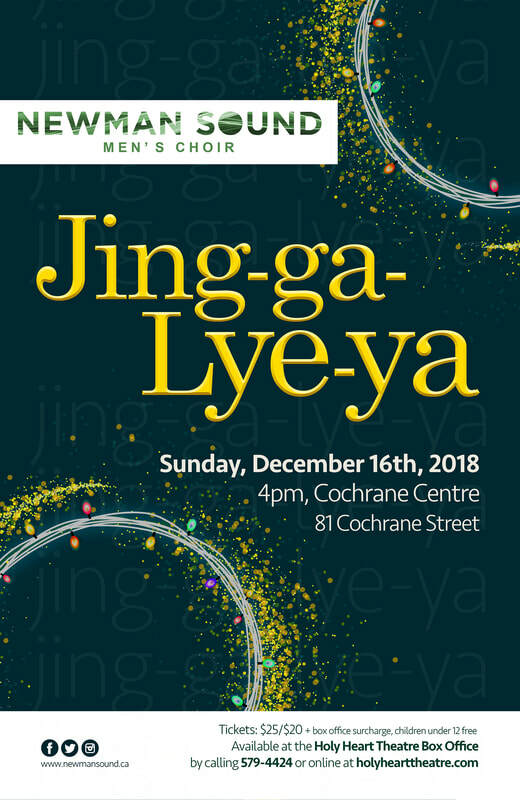 Newman Sound Men's Choir and Lady Cove Women's Choir are ecstatic to perform alongside one of Canada's most highly regarded choral ensembles. the Canadian Chamber Choir, as they visit Newfoundland & Labrador for the very first time. With singers representing nine provinces, from sea to sea, join us as we explore a diverse mosaic of music, inspired by all things uniquely Canadian! Box Office Hours: Tuesdays - Fridays 10am-5pm. Tickets paid by credit card can now be printed at home as well. *Delegates of The Singing Network can purchase tickets for a reduced price at registration. Visit www.thesingingnetwork.ca for more details.